Parmesan crisps with goat cheese mousse for nibbles. There will be the option of cheese after pudding for a small additional cost if you are still peckish! We really hope you like it. Bring your own booze. We saw our first snowdrops of the year, days are getting longer, weather getting better(ish), can't be long now. It's been way too long, we know. And we know we've been promising for ever that we'd do another. Well, we've finally got our fingers out and are excited to announce our next FiveGoMad pop-up dining event. 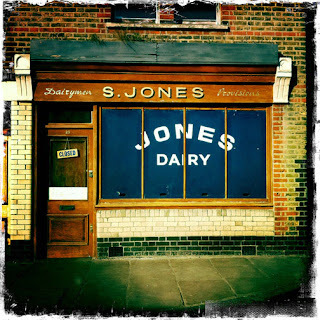 The venue is the same as before, the delightful, cosy, intimate Jones Dairy Cafe, Columbia Road. We don't believe in changing a winning formula! This not to be missed event will be on Wednesday 2nd March 2011. Simon will once again be riding the range, whilst Clare will be repeating her role as simultaneous 'front of house'/washer upper. Yes, we leave the multi-tasking to the ladies. This time we are serving a four course meal, using locally sourced, seasonal ingredients, to create something really memorable for you. In the spirit of keeping you all in suspense, we will be announcing the menu closer to the event. This is not because we haven't decided on it yet. No way, really, we just want to, er, stay in the spirit of the whole pop-up thing. Thinking about it, maybe we should have kept the venue secret too? The cost is a recommended donation of £25. Just bring your appetite and something to drink, to help the evening along. Unfortunately we are having to limit the number of places this time to 30, so book early to guarantee your place. Keep your eyes on this blog for an update on the menu. Kick off will be at 7:30, carriages at 11:00!